In many ways, this is a difficult blog for me to put together. So many thoughts and directions I want to take and talk about surrounding the major motion picture, The Promise especially as today marks the 102nd anniversary of the Armenian Genocide. 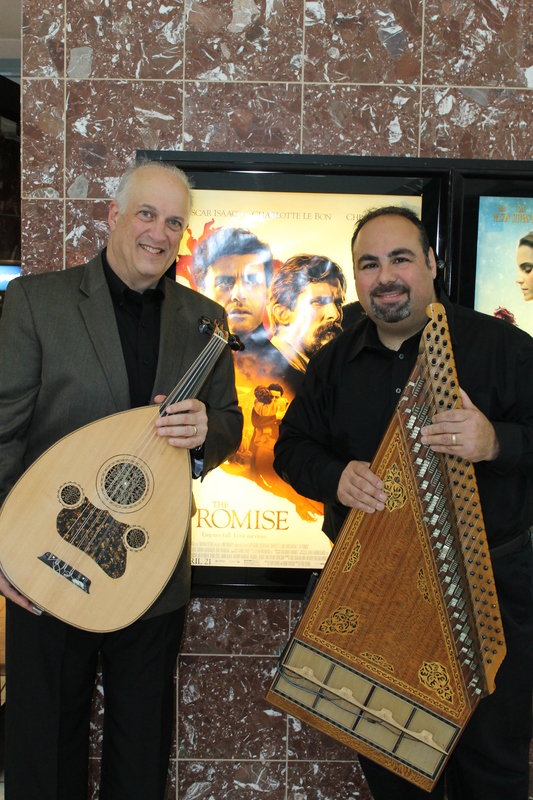 Mark and I outside of the theater prior to our first performance. 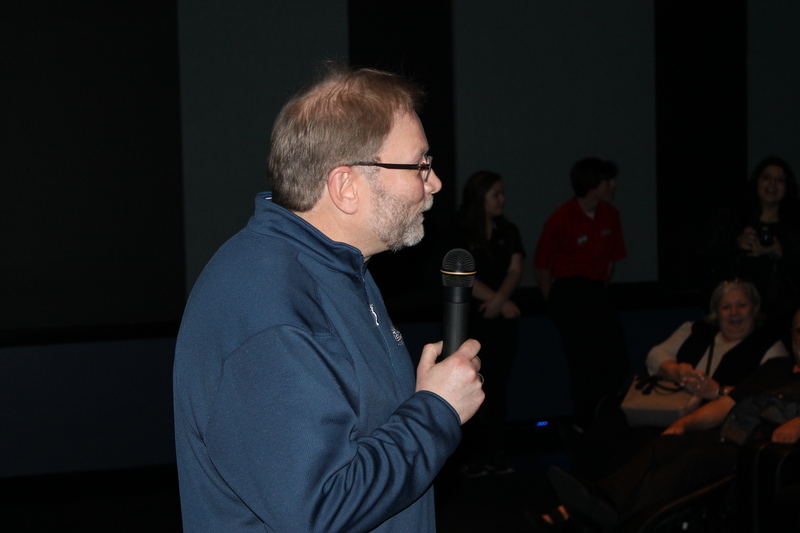 For me, the voyage of participating in the Detroit premiere began when I spoke to my friend Cory Jacobson, the owner of Phoenix Theatres Laurel Park Place. I asked if he would be interested in showing The Promise at one of his several theaters in Michigan. He was immediately interested (he knew of the movie) and within a few days he was able to confirm the screening of the movie. His theater was one of the first movie theaters to actually announce and provide showtimes in metro Detroit. Cory wanted to make this “a community event” for several reasons. He is a great entrepreneur that understands providing value to his customers. He also has a personal connection to the Armenian community where he grew up in Wisconsin. Therefore he asked if I would play some music before one of the showtimes. I was honored and happily accepted. 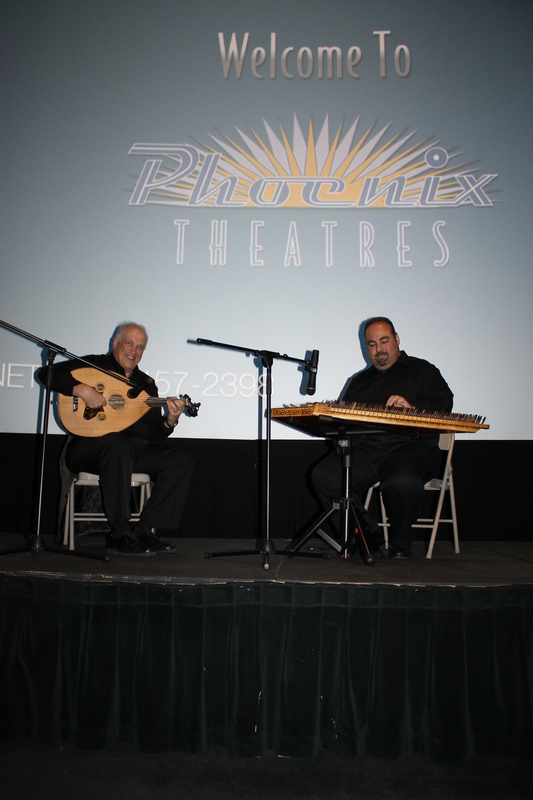 Asking my good friend Mark Gavoor, from Chicago, to come to play along side me on oud – we were both excited to provide some ambiance for the audience before the film began. Upon announcing that there would be music before the 8pm screening of The Promise to the public – the showtime sold out within three days. We added another showtime for us to play music and that quickly sold out as well. It seems we could have played several of these showtimes to help fill the seats. The response from the Armenian community was amazing. As a matter of fact, the theater did a brisk business all weekend long for this movie. I even donated my CDs to patrons that bought tickets for the Sunday showtimes. Phoenix Theatre owner Cory Jacobson welcoming the crowd before The Promise. Also through Cory’s efforts, some great publicity was achieved including two articles in local newspapers: The Observer Eccentric and Detroit Free Press. This certainly helped spark the sold out showtimes. Sold out showtime at Phoenix Theatres Laurel Park Place on April 21st. Too be honest, playing music for such an event was more of an honor than I expected. I have played many different types of events over the years, but this one was different. Having the the opportunity to see the film the night before solidified how I would feel the next day playing music. The film – completely mesmerized me. Immediately I felt the obligation to perform music to help promote this film so that its reach would be far and wide. Even the type of music we would perform changed overnight. As I mentioned in my welcoming remarks (see the video below), the music that I mainly perform can be classified as mainly upbeat. Not all of it certainly, but good portion of it. I didn’t feel that what we should play should draw away from what the audience was about to witness and felt that that we should honor the film by performing classical and folk Armenian songs which was more of a somber mood. 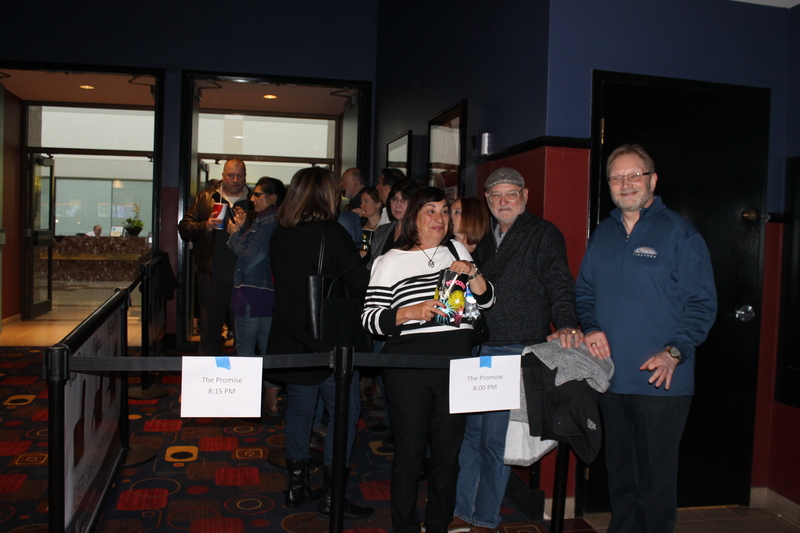 Cory with some of the guests waiting in line to see The Promise. It was my understanding that at the end of each showtime, the audiences could wiping away tears and some applauding for the exceptional work that was accomplished in this production. A production that I learned was close to 40 years in the making as Clark Gable was originally slated for this story. It took one man – Kirk Kerkorian, an Armenian philanthropist, to give his own money ($100 million) to see his dream come to reality. Sadly, he passed before the film was released, but he has secured his place in history for brining such a film to the general masses. 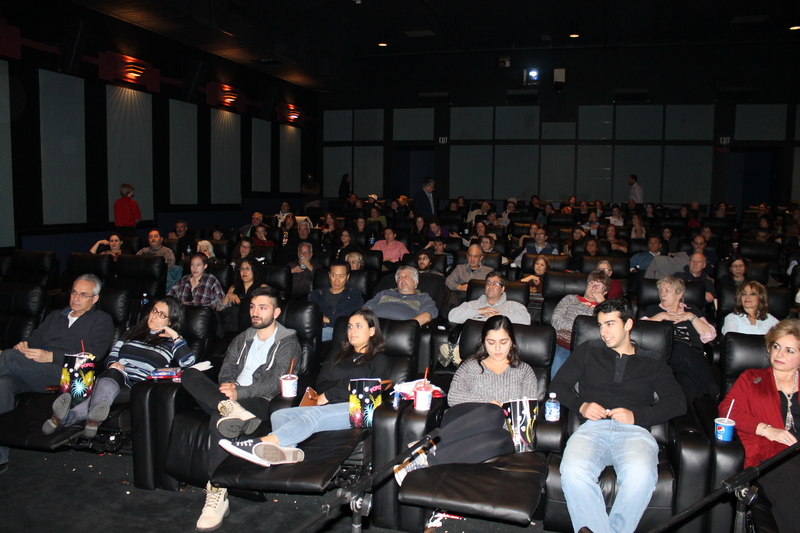 This entry was posted in Armenian, armenian genocide, music, Uncategorized and tagged Christian Bale, detroit, Eric Esrailian, film premiere, kanun, Kirk Kerkorian, Livonia, michigan, music, Oscar Isaac, oud, Phoenix Theatres, Terry George, The Promise. Bookmark the permalink.